A bold yet feminine 37mm case circumference in polished stainless steel supports the signature Formula 1 bezel that sets 84 Wesselton diamonds. 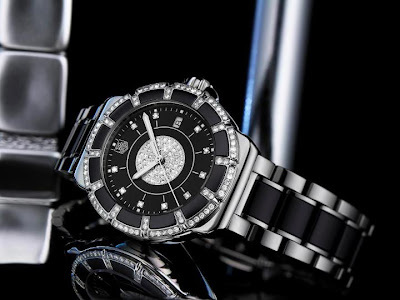 The 12 deep black high quality ceramic inserts underline the sparkles by contrast, making the watch reminiscent of a dazzling flower. Its gorgeously feminine and smooth bracelet, an eye-catching combination of deep black ceramic and polished stainless steel, is held secure by the stainless steel butterfly folding clasp  designed to be effortlessly opened and closed for women on-the-go. 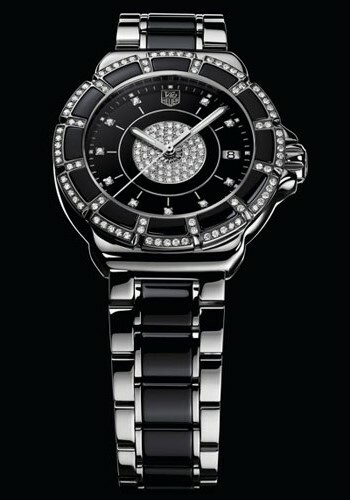 Dial heart is replete with 54 glittering Wesselton diamonds and surrounded by 10 stones used as hour markers, a date window at 3 oclock and TAG Heuer three dimensional monochromatic logo at 12 oclock. Each and every single one of these diamonds has been set with 4 stainless steel beads closed by hand. Polishing each jeweled part of this timepiece requires the highest level of expertise to give the setting the utmost level of shine without loosening the stones.